I have read one other mystery in this series about the murderous vicar in 1950's England whose dog and cat alternate narration duties with the vicar himself. The cover blurb states: "A perfect, one-sitting summer read." Not for me. It dragged. I wasted time. It put me to sleep. Finally I gave up. In principle, if you like quirky, funny English cozy mysteries that take place in villages populated with eccentrics, then you might like this. I can say, to be fair, that this series should probably be read in order because there are many references to past books and the plot is rather convoluted as a result.So there you go, I usually don't write a review unless I have something good to say, but I am interested in why some books works for a reader and some don't, and especially with humor, what makes one person laugh falls flat with another, so just ignore my review and give this series a try anyway if you like mysteries. 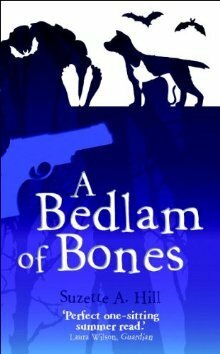 Here's my review that appeared in the November 2011 issue of Historical Novel Review:This mystery is the latest in a series, Bones in the Belfry, A Load of Old Bones, Bone Idle, and Bones in High Places being the earlier installments. The books have a charming premise: some chapters are told from points of view of the protagonist reverend’s dog and cat, Bouncer and Maurice. There’s a dead-on Miss Marple British village setting complete with eccentric characters; and the author’s style is cheeky, chirpy, and witty. She’s also got a nice plot, a tale of a blackmailed bishop amidst treacle tarts, waistcoats, and buggery.I finished it with some relief, weary of feeling perplexed about what was going on. I have read a fair amount of British fiction, but this was hard work. The glib repartee here is evidently graduate level British English, and it turns out I’m a dull American sophomore. More confounding yet was that instead of a backstory the book has 25 footnotes. “First mentioned in A Load of Old Bones,” “Dumont appears in Bones in High Places,” “See A Load of Old Bones.” I puzzled over the story’s era; my guess is the 1930s. The reverend drives an old Singer. Maybe the ’50s. It was as though the first third—or more—of the book were missing. See Bones in the Belfry indeed. This whole series is so delightful: soundly plotted, a cast of wonderfully believable oddities, I wish it would never end but it must be so according to the wise author who knows how to keep a gem a gem.The idiosyncratic nature of the protagonist, his on-going and progressively more complicated predicaments and his equally eccentric surroundings are well anchored in the monstrously entertaining reflections of both of his inherited "pets": one cat Maurice and one dog Bouncer.... a hugely impressive study in animal insight if ever I read one. These are not cutesy canine or petty feline exchanges revealed to a nauseatingly twee degree. Hill has the exact tone right for each animal correct to it's species and single-minded personality. These two animals are the only ones on this arc who have their heads on straight and ultimately I hope will deservedly triumph over the unnecessary but entertaining complications the silly humans create in the end. One can only sympathise with companion animals the world over, similarly subjected to the inexplicable whim's of their humans. The worst cozy I've ever read. I'm not one to normally give up on a book. I normally stick it out until the end hoping for something to change, for the ending to redeem the rest of the book. This is one that I just could not get through no matter how hard I tried. The writing was terrible, filled with much more slang than is necessary to make the story fun and set the tone of the time period. Bouncing back and forth between so many points of view does nothing but stretch the story and make the plot seem convoluted. There is absolutely nothing interesting, just a tangled up confused story that is impossible to take seriously. I enjoyed the first book in this series very much, while originally the old fashioned writing style and the narration captivated me, unfortunately it now seems repetitive and think it really was time to finish. A decent finale. Glad this has finished. I feel it was dragged out too long. I enjoyed the first 2 very much. The 3rd one was slower the 4th, helped by a change of scene, improved. But this one felt interminable. That said I'm glad I've the Revd Francis right to the end. Have been waiting with bated breath for this intallment of the follies of F.O. and his furry friends. Hill instills A Bedlam of Bones with her wonderful wit and keen sense of the silly into the story.But... My hopes for the future are dashed. I liked it - although I thought the resolution (which was to the whole series) was a bit of a let down. I've always enjoyed the different memoirs by both the human and animal characters. It will be interesting to see what Ms. Hill will write next. Suzette A. Hill - Suzette A. Hill was born in Eastbourne, Sussex, in 1941. She is a graduate of Nottingham and Newcastle-upon-Tyne Universities. Hill taught English literature all her professional life. At age sixty-four and retired, she tried her hand at a short story - just to see what writing fiction felt like, and to her surprise a quintet of humorous novels (Reverend Francis Oughterard series) was the result.